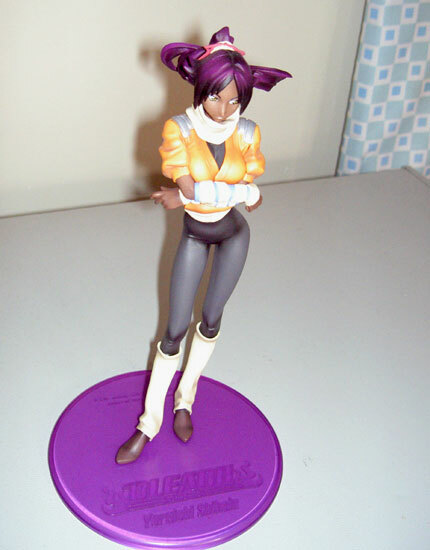 I've been a big fan of Megahouse's Excellent Model Series figures since picking up some Bleach ones a couple of years ago. Since then the range has expanded to include Saint Seiya and further Bleach figures, as well as re-issues and new releases for the earlier One Piece Portrait of Pirates range. Now Megahouse have tried something a little different - the inexplicably titled Excellent Model Mild range. These Excellent Model Mild figures are the latest in the One Piece Portrait of Pirates range, and this time focus on the Strawhat Pirates when they were children. This first range includes Captain Monkey D Luffy, ship's cook Sanji and ship's historian Nico Robin, and depicts each as they were during their origin stories from the manga. Each figure stands at around 7" (17cm) tall and require some basic assembly, but each figure comes ready-painted to a very high standard. was when he first met the pirate Red-Haired Shanks. Sanji comes dressed in his chef's outfit and clutching a kitchen knife as he was before the ship he was on was attacked by pirate Red Leg Zeff, and Robin is wearing her purple dress and clutching a history book as she was before her homeland of Ohara was attacked by the Navy. The attention to detail and sculpting is superb on each figure, with each looking like they've leapt from the pages of the manga or the TV screen. Despite their 'Mild' tag suggesting that they are lower quality than the full Portrait of Pirates range, this is simply not the case. The painting is near perfect and there is plenty of detail despite the smaller size of the figures. It is nice to see that they are in scale with the full figures as well. Eiichiro Oda's cartoony art style translates exceptionally well into display figures, and these look great even when put next to their larger Portrait of Pirates counterparts. either. 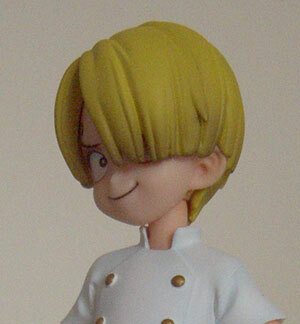 In fact the only noticeable join line on the figures are the hair, which is split into two segments. However, this is very common for anime figures and in this case it's necessary in order to attach the alternative face that is included with each figure (see Extras, below). Once again Megahouse have outdone themselves with these figures. Don't be fooled by the 'Mild' tag, these are every bit as good as the other Excellent Model ranges, they're just smaller. At the moment I can't think of anyone who does better PVC figures than Megahouse, and these are as good as anything they have produced. The cheaper price point makes these a must-have for fans of One Piece, and for anyone who appreciates cute or high quality figures. As with all of these types of ranges the One Piece Portrait of Pirates Excellent Model Mild are all limited edition and will be incredibly hard to get hold of in a couple of month's time, our suggestion is get online and pick them up now. You won't regret it. 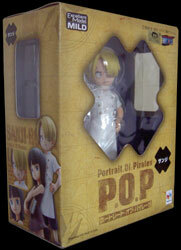 A plastic base with the character name (in English) and the Strawhat Pirates emblem is included with each figure. The base has pegs on it for the figure to attach to and no glue is required. 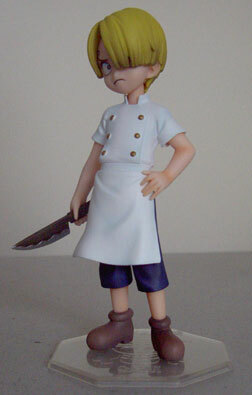 Also included with each figure is an accessory, Sanji has a chef's knife, Luffy a knife and fork (plus an optional bit of meat) and Robin has a book. However, best of all each figure comes with an alternative face, that can be attached by pulling the front segment of the hair off, swapping one face for the other and re-attaching the hair. Robin and Sanji both come with alternative happy faces to replace their usual serious faces, whereas Luffy comes with a grinning face to replace his shouting one. Great stuff!